The next time Raku is full, we suggest crossing the street and walking into the far corner of the two story Pacific Plaza shopping center, where a bounty of great Japanese eats is available. The food may not be as pristine as the charcoal-grilled perfection of Mitsuo Endo, but we’ve never found a flaw in Shuskeki’s gyoza, tan tan men (spicy pork miso ramen noodles), omurice (Japanese rice omelet), or takowasabi (slimy raw octopus in a slick wasabi dressing that’s a lot better than it sounds). Best of all, the menu is all pictures, so we round-eyes can get a good look at what oddball concoction we’re experimenting with. If your tastes run to more conventional sushi, sashimi, and udon noodle bowls, those are splendidly done here as well. Shuseki makes it easy to try new Japanese food (even the take out menu is all pictures), and the prices are just as easy to swallow. Our last dinner for two came to $45 including tip. 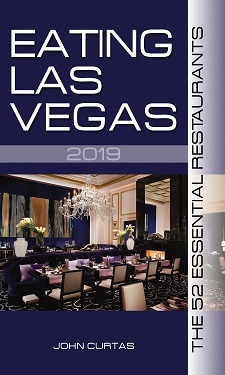 I’ve been observing your blog for some time & have never until now been so intrigued to try one of your recommendations…I’ve eaten at Raku along with Lotus of Siam & both Mimmo Ferraro’s old & new locations…I’d say that these (3) restaurants are arguably some of the best in Vegas if not in the country for not only what they serve, but who’s in the kitchen! With that, Raku’s food is nothing shy of spectacular & possibly only 2nd to something in or near the Tsukiji Fish Market in Tokyo – so again, with a suggestion like yours, I’ll give Shuskeki a try the next time I’m in town whether it is for business or pleasure!